As a child I drew nothing but horses. As I grew older, my mother would counsel me to “please try drawing something besides horses”. To satisfy that nagging little voice, I left horse drawings behind in high school and never looked back for 40 years. During this time, only an occasional animal appeared in my work, causing a bit of a surprise when it did. My mentor Alex Vilumsons, with whom I worked 5 years in Los Angeles, insisted that humans and animals be excluded unless the artist knew how to avoid falling prey to the "cuteness" factor. This philosophy became the basis of my work, but had to be overcome when I decided, many years later, that I wanted to return to horses. Now that I have spent over a decade riding and training my own horses, my childhood fantasies are reality and I now paint equine portraits with the express intent of portraying a particular animal’s personality and style. There is nothing quite like the bond between the equine and its human partner. I could paint my own Billy's image and feel that it was truly him because I knew him so well. That is why a critical part of my relationship with a client is to seek out the nature of that person’s bond with their own horse. The more details I discover about you and your best friend, the easier it becomes to create an image which speaks to that magical relationship. My paintings are the result of thin layers glazed over one another; the underlying composition must be strong and the paint must be applied with a purposeful technique. Whether it is a portrait or landscape or rural buildings, I construct the image through layers, attempting always to create a sense of depth through transparency, color and light. When working on a horse portrait I sometimes use a technique I discovered a few years ago when creating my own self-portrait. I use pen and ink to make a drawing on canvas, in a cross-hatch pattern similar to engraving. I then apply the layers of paint over the ink, letting the underlying drawing show through. The contrast of sharp definition ink against soft definition paint energizes the painting and helps bring it to life. Alli served on the board of directors of Artist Co-op 7, a group of independent artists who joined together to facilitate solo and group exhibits in restaurants and public buildings in the greater Los Angeles area. She was a founding member of this group in 1989. In 1993 she became a member of LAart, an artists' alliance with five galleries in the Los Angeles area, and in 1994 she joined the Topanga Canyon Gallery artists' cooperative. In 2015 she became a co-founder of a new artists' organization, Cass Area Artists in southwestern MIchigan. She has had work accepted in national and international juried competitions and received awards, most recently first place in the watercolor division of River Art, sponsored by Sunbury Press and West Shore Gallery in 2011. In 1994 and 1995 she received favorable mention in the Los Angeles Times. She is currently a member of the Institute of Equine Artists. 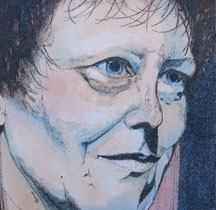 Published books featuring her paintings are "Woodlands and Waterways" in 1994 and "River Art" in 2011. Her paintings are in private and corporate collections across the country. She regularly blogs about art, horses and occasionally some odds and ends on Alli Farkas Artist Adventures. Here's the original ink and oil on canvas self-portrait which was purchased to form part of a traveling exhibit accompanying performances of "Menopause the Musical" across the country. I titled it "Honestly", because it's a painting of me with no makeup!